In this class we will explore the principles of sacred geometry, mandalas, and crystals. 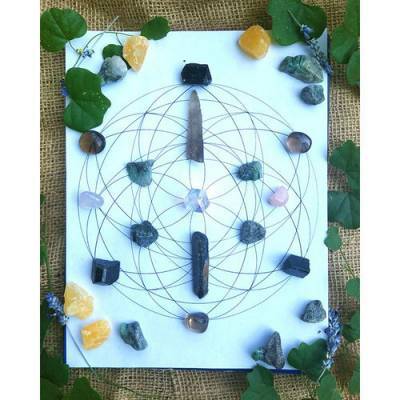 You will make your own crystal mandala, and learn how to use crystals to energize space, clear negative energies, and as a tool for manifestation. All materials will be supplied. Mandala is a Sanskrit word that means "circle," but a mandala is hardly such a simple thing. It is a sacred form of art that incorporates the principles and proportions of sacred geometry to represent a wholeness. It can be seen as model for the organizational structure of the cosmos itself, and reminds of our relationship to the infinite. These sacred creations hold great power when they are made with intention as a kind of prayer or meditation. As you make a mandala, your thoughts and intentions are given shape and form. While mandalas can be made out of any medium, using crystals is especially powerful as the stones themselves hold vibrational energies that endow extra energy to the intention of the mandala. In this class we will explore the principles of sacred geometry, mandalas, and crystals. Students will each receive a screen printed mandala grid, featuring a mandala designed and hand drawn by Andrea. Each student will also receive a set of crystals they themselves will select for their crystal grid. You will learn how to use those crystals to energize space, clear negative energies, and as a tool for manifestation. This class is taught by Andrea Julian. Andrea has been working with crystals and sacred geometry as a spiritual practice and as an aid for manifestation for over a decade. This class is held outdoors in the beautiful, shaded Articulture gardens. In the case of light rain, the class will continue in one of our covered areas. If a forecast appears especially uncooperative due to heavy storms or winds, we may reschedule the class for a later date. We will notify you ahead of time via email if the class is being rescheduled. You will have the choice to A) keep your spot for the rescheduled date, (B) use your credit for another class or boutique purchase, or (C) receive a full refund.